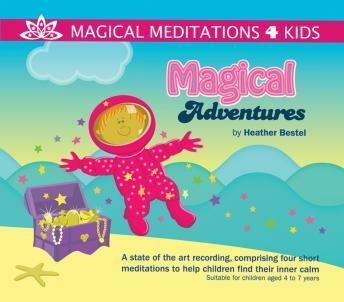 Magical Adventures' is a superb high quality meditation recording by Heather Bestel. Heather is a very experienced psychotherapist who has worked with children developing and building their self esteem and confidence since 1994. This CD/MP3 is a lovely and safe way for our 4-7 year old magical explorers to discover their inner resources as they venture. Helping them along the way to build their confidence and creativity. With the use of these CDs/MP3s children learn to find their inner calm and develop some wonderful resources to empower them whenever they need. This recording includes four tracks: 1. Magical Undersea Adventure (9:11) 2. Magical Space Adventure (7:39) 3. The Magic Circus (6:48) 4. Magic Carpet Ride (11:16). ‘Magical Adventures’ is ideal for using at home: during chill out time, at bedtime, on long journeys, before exams or anytime children need to switch off and relax.